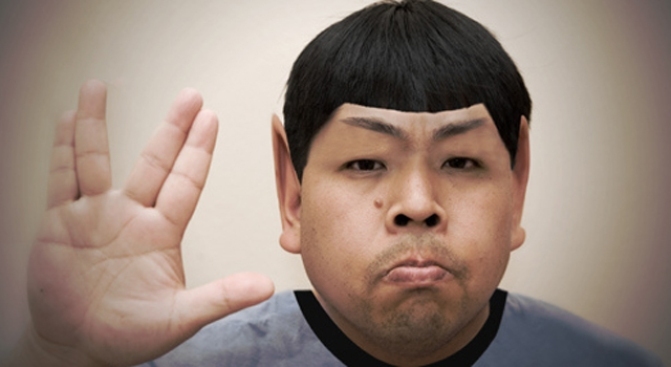 This man swears he doesn't like Star Trek. Sure we say. DANGEROUS LIASONS: Letting Trekkies play with Twitter is a dangerous thing. But the StarTrek San Francisco Twitter Trek is happening anyway. So stretch your ears and teleport yourself to the AMC Kabuki 8 Theatres, 1881 Post St., in San Francisco to geek out at the Star Trek premiere of the movie. Party before the late showing. Get more information and tickets for $10.75 at the theater's Web site. EVERYTHING'S CHANGING: If geeking out is not your thing, you could get your groove on as the British lads that are Keane play The Den at the Fox Theatre, 1807 Telegraph Ave., in Oakland at 7 p.m. Tickets are still available from our friends at Ticket Master. STRANGE ACOUSTICS: If you need more of any indy down home fix you could check out the self proclaimed strangest man in acoustic music. Richard Gilewitz will bring his fingerstyle guitar skills to Mission City Coffee, 2221 The Alameda, in Santa Clara.